This is a common term you may encounter reading your MRI report. Diffuse cervical bulge means a generalized disc bulge of one of the spinal discs of the neck (cervical spine). This bulging material may contact or “pinch” the thecal sac or nerve roots. There are a variety of symptoms n a case like the one above. Some people may experience little to no discomfort, while others may have severe radicular pain, which travels to the shoulder blade, down the arm and into the hand or fingers. Some people may experience numbness and tingling of the arms and hands. Sometimes your MRI reports may mention certain words or phrases that are confusing. We will go over some of the common ones. 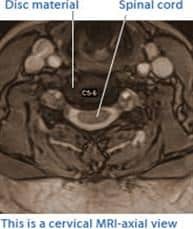 You may read “moderate disc desiccation with intervertebral disc space narrowing”. Desiccation refers to the state of extreme dryness. In biology, desiccation refers to the drying out of a living organism or tissue. This is a loss of water from the intervertebral disc. In a dehydrated environment, the disc will have a hard time trying to heal. Intervertebral disc space narrowing refers to the disc in between the spinal bones, which is beginning to lose material and substance. It is degenerating of “collapsing”. You may read “mild posterior osteophytes centrally impress on the ventral thecal sac”. Posterior refers to the back. It is an anatomical descriptive term. Impress means to indent of affect. Ventral refers to the front, the opposite of posterior. Thecal sac is the outer covering of the spinal cord. This means there are bone spurs on the back of the spinal bones, putting pressure on or affecting the front part of the outer layer of the (neck) cervical spinal cord. You may read “There is mild effacement of the cervical cord. There is mild to moderate narrowing of the right neural foramina and lateral recess”. Effacement means obliterating or erasing while right neural to the Intervertebral foramen: an opening between vertebrae through which nerves leave the spine and extend to other parts of the body. Lateral recess is descriptive term of the foramen. Here we have some erasing of the cervical cord in the image or picture. This is usually from the herniation of the disc tissue or from bone spurs. Also we have some narrowing of the opening between spinal bones, through which the nerves exit the spine. This is not indicating what is causing the narrowing, but it could be due to disc herniation or bony overgrowth (bone spurs). For more information on other specific conditions, click any item in the list below.